After a week of violent protests that claimed seven lives,Israel on Tuesday removed controversial metal detectors installed outside the entrance of the sensitive compound that houses al-Aqsa mosque in the Old City of Jerusalem. The detectors were removed after the announcement came from the office of the Israeli prime minister, Benjamin Netanyahu following the decision made by country's security cabinet based on the recommendation made by Israel's security agencies, CNN reported. The security set up was placed at the Al-Aqsa Mosque, Islam's third holiest site,two weeks ago after an attack at the site,,that led to violent clashes and increased tension in the wider region. Instead of metal detectors, Israel plans to install unspecified advanced technologies and "smart inspection." The removal of the detectors on Tuesday appeared to be part of a deal that saw the repatriation of Israeli diplomats from Jordan,including an embassy security guard who had been involved in a fatal shooting of two Jordanians on Sunday night. Israeli Prime Minister Benjamin Netanyahu spoke to King Abdullah II of Jordan on phone on Monday night in an effort to defuse a diplomatic row in the aftermath of Sunday's attack on the Israeli embassy in Amman. Palestinian worshippers and Israeli police clashed on Friday outside the Old City of Jerusalem after the Israeli authorities' decided to bar male worshippers under 50 from entering the area for Friday prayers. 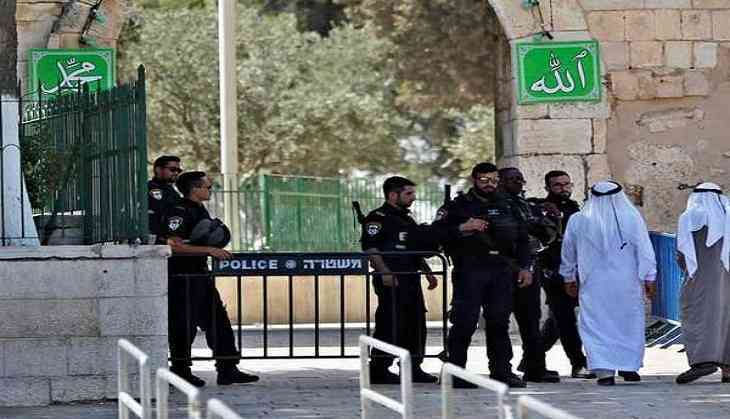 The Waqf, the Jordanian religious authority which administers the Temple Mount, has condemned the use of metal detectors to scan worshippers. Waqf religious leaders have refused to enter through the detectors which have been set up as part of the security clampdown.